For commercial and high-end residential swimming pools and other water applications. Available in flows to 800 GPM , and from 3 to 15 HP. 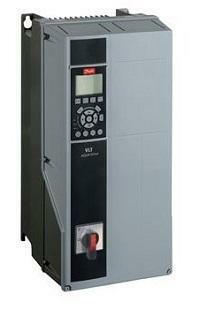 EQ Series® high performance commercial pumps are designed for maximum efficiency and quiet operation in every detail. 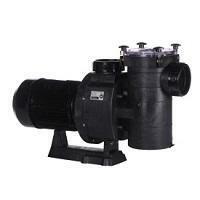 They are the only noncorrosive, all plastic pumps designed exclusively for the commercial pool and water applications market. EQ Series impellers are manufactured for true breakthrough performance, allowing for lower loads and longer motor life. Available with and without strainer pot. 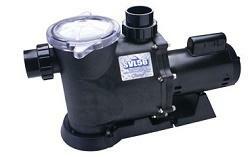 Our "Standard" Commercial Pump, The EQ has taken the commercial market by Storm. It is a eazy way to increase you efficiency and drecrease operation costs. Make the EQ Serier Even More Efficient Cost Saver! This pump was developed using the most advanced computer-aided design and manufacturing (CAD/CAM) plus Computational Fluid Dynamics (CFD) and Finite Element Analysis (FEA). The proprietary impeller design delivers a higher level of precision concentricity for increased effciency. The proprietary hydraulic isolator smooths the priming water at start-up and also smooths the flow inside the volute, raising the efficiency even higher. With outstanding performance from both a maximum-flow and mean-flow perspective, the Max-E-ProXF is an ideal choice for commercial pools. Available in 2,3,5 HP. The IntelliProXF pump comes packed with many more features to make it easier to use and last longer, including a super-quiet totally enclosed fan cooled (TEFC) motor, long-lasting EPDM seals, and our exclusive Cam and Ramp™ see-through lid that makes inspection and cleaning a breeze. It took computerized Computational Fluid Dynamics and Finite Element Analysis to achieve it. 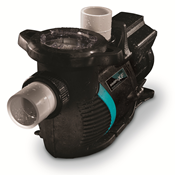 These operating hydraulic improvements are paired with Sta-Rite IntelliPro® variable speed technology, a proven design that has led the revolution in pool pump efficiency. Together, these innovations create the most advanced, smoothest-running, and most energy-efficient pump Pentair's ever made. High efficiency, low maintenance and maximum performance—all the features demanded by today’s pool professionals. Available in single- and two-speed models, with ratings from 1/2 to 3 HP. Fast cleaning with a new Quick-Lock trap cover ring permits fast access to strainer basket. Large “see-thru” lid makes it simple to check for debris. A strong, sturdy, specially-designed base dampens sound and vibration, making the Max-E-Pro one of the quietest pumps in its class. 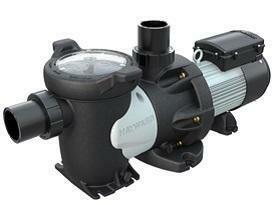 The IntelliFlo Variable Flow pump is the world’s smartest swimming pool pump. Its onboard computer and intelligent software automatically calculate and program the minimum flow requirements for every pool task—filtering, heating, cleaning, spa jets, water features and more—to optimize performance and minimize energy use. As functions/tasks change, IntelliFlo self-adjusts to maintain optimal flow rates for further energy savings. 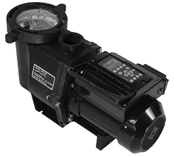 IntelliPro Variable Speed pumps combine variable drive technology, onboard digital intelligence, and permanent magnet motors (used in hybrid cars) to reduce pump-related energy costs by up to 90%. 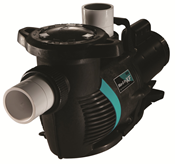 The new IntelliPro VS+SVRS model is the first swimming pool pump to feature a built-in Safety Vacuum Release System that detects drain blockage and automatically shuts the pump off. 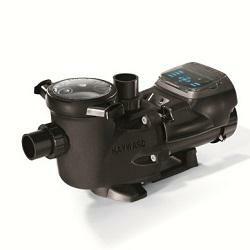 Hayward Commercial Pool offers a complete line of technologically advanced pumps. 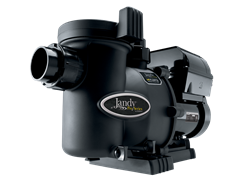 From the, HCP2500 Series EcoStar C - versatility of Hayward's new HCP 3000 Series, Hayward Commercial has the pump to suit any commercial pool, spa, or water feature. The Stealth is a professional-grade pump that combines superior performance with energy-saving efficiency and “Quiet Technology”. The Stealth is easy to install, and contains the large trap basket for easy routine maintenance. The extraordinary quietness of the SVL56 moves nearer to the goal of silent operation, and it provides good vertical lift. A true 56-frame motor ensures long life and uninterrupted power.